I was trying to make an event, when player uses a shield and blocks incoming damage. Using damage zones and damage dealers. 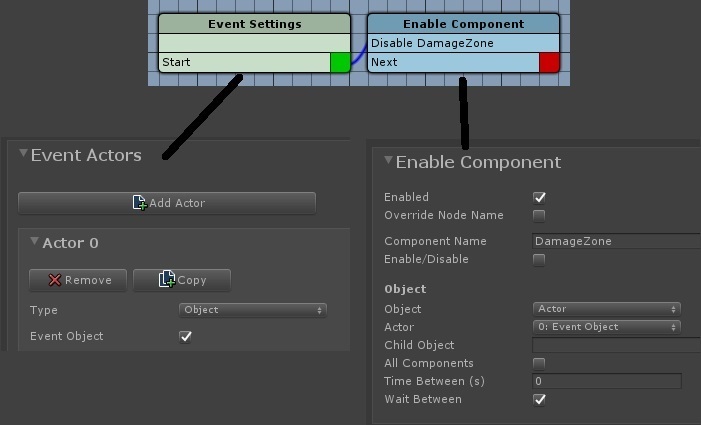 I tried disabling damage zone (with "enable component" node), but it couldn't find "Damage Zone" component attached to the player. The same with "Change Fields" node (I was trying to change damage zone's "Block Damage" field value through the event), it just can't find the component. I'm typing name like "Damage Zone" and "Damage Zone (Script)", it doesn't work. When typing component names use CamelCase. i.e. "DamageZone"